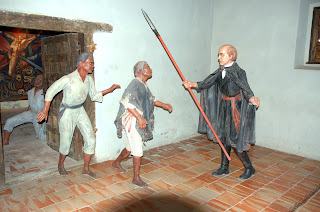 On September 28, 1810, twelve days after Hidalgo’s ‘Grito de Delores”, Miguel Hidalgo and 20,000 rebels attacked the Spanish Garrison in the nearby town of Guanajuato with pitchforks and machetes. The Spanish barricaded themselves in a massive stone seed and grain storehouse built around 1800. It looked as if the outnumbered but better armed Spaniards might be able to hold out. 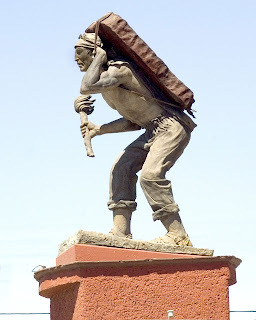 Then a young miner named Juan Jose de los Reyes Martinez (aka “El Pipila”), acting under orders from Hidalgo, tied a slab of stone to his back and, thus protected from Spanish bullets, carried a torch up to the wooden gates of the storehouse and set them ablaze. When the gates burned and fell, the rebels rushed the storehouse, killing most of the Garrison inside. It was the rebel’s first major victory in Mexico’s War of Independence. 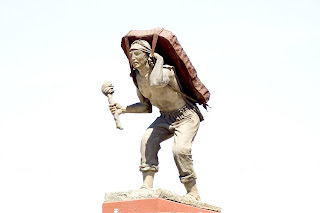 “El Pipila” is honored as a Hero of the Independence Movement. Some recounts of the event report him killed in the ensuing battle but others report him surviving and living to a ripe old age. I prefer the later. 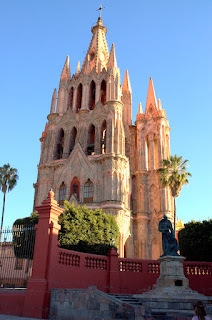 We are staying in San Miguel de Allende for a few more days. Getting the damaged roof of the motorhome looked at too a long time and prevented us from seeing all the sights around here. This is an important area to me and I do not want to cut my visit short. 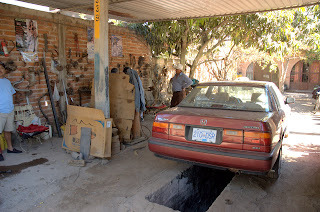 The damage turned out to be covered by our Mexican Vehicle Insurance with $500 USD deductible. They want us to have it repaired in Mexico up near El Paso, Texas where we were going to exit anyway. I will make a temporary repair with Duct Tape to prevent any more damage. There is no chance of rain down here so that is not a problem. There is no longer any Internet service from the RV Park - router crash and burn - so I have to use internet Cafe's. As a result my postings will not be a frequent. 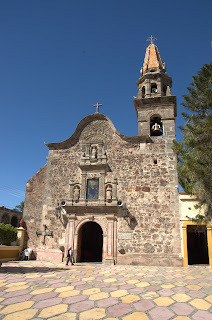 This is the Church in Dolores Hidalgo where the Revolutionary Priest, Miguel Hidalgo issued his "Grito de Dolores" or "Cry For Independence". 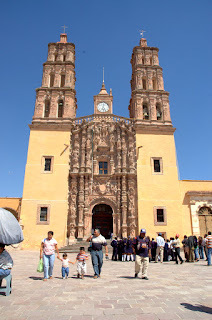 The first two shots are of the exterior of the Church and the third is the interior, filled with Mexican people who make a once in a lifetime Pilgrimage to the Birthplace of their Independence. 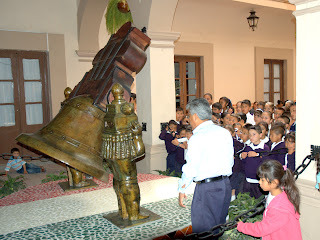 The fourth shot is of a group of schoolchildren being shown the actual bell that awakened the town at 5:00 AM on September 16, 1810 for Hidalgo's proclamation of Independence. My visit to this area has really moved me. It is now easy to understand the Mexican people's visable pride in their Country and Heritage. 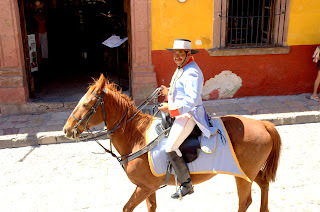 This is the Revolutionary Priest, Miguel Hidalgo of Dolores, Guanajuato, Mexico. 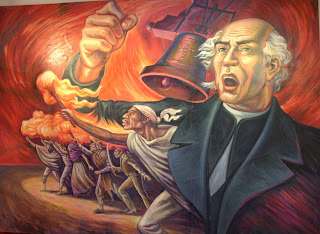 He is the Priest of Dolores who rang his Church Bells at 5:00 AM on September 16, 1810 and awakened his Congregation with his "Grito de Dolores" or "Cry For Independence" from Spanish Occupation and for the abolition of slavery in Mexico. Ten months later he had been Excommunicated by the Catholic Church (which evidently took offense at one Catholic calling for death to other Catholics), captured by the Spanish oppressors, executed and had his head, along with Allende's and others, hung on the city walls. Instead of having the intimidating effect they hoped for, this gruesome display spurred the people on to further the Revolution and to eventually win Mexican Independence from Spain. Migual Hidalgo is a true Hero of Mexican Independence. The first two drawings depict Hidalgo freeing the prisoners and issuing his "Grito". 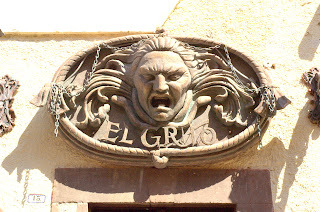 The third is Hidalgo's severed head as it was hung from the city walls by his Spanish executioners. 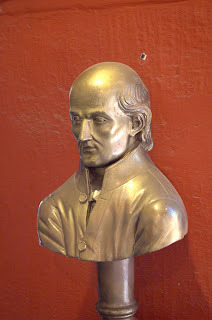 The final is a Bust of Miguel Hidalgo. This is the best part of Mexico we have been in yet! 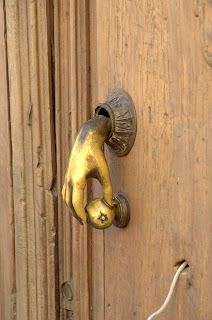 It is right in the seat of the beginnings of the 1810 Movement for Independence from Spain. 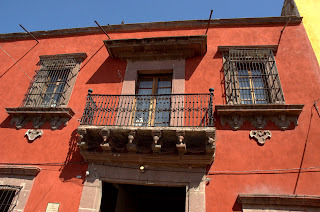 It is the home of the Revolutionary leader Ignacio Allende, a Captain in the Spanish army who grew sympathetic to the plight of the Aboriginal peasants whose numbers had decreased under Spanish rule from an estimated 25 million to less than 1 million. 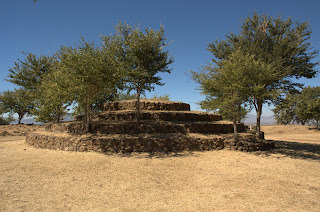 Because of this exploitation and murder of the indigenous population, Allende joined in the conspiracy to overthrow his own countrymen. 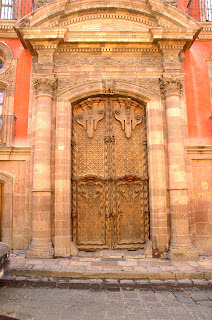 The name of the city of San Miguel was changed in his honor. 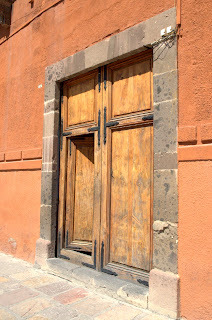 The Revolution started at five AM on September 16, 1810 when the Priest, Miguel Hidalgo of nearby Dolores (now named Dolores Hidalgo) woke his Congregation with Church bells and issued his "Grito de Dolores", calling for Independence from Spanish rule. He was then joined by Allende and others and soon an army was formed and the Revolution had started in earnest. There had been skirmishes of resistance here and there over the previous few years but the Insurgents were without skilled leaders. People like Allende provided this leadership. 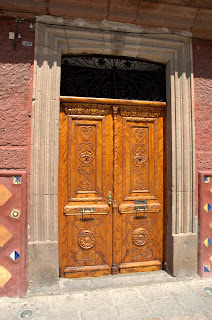 San Miguel de Allende is a favorite place for expatriate Canadians and Americans and has developed into an artists community. It is the home of Toller Cranston, the Canadian Figure Skater, and the actor, Antonio Banderos, among others. This influence is seen in restaurant, hotel and real estate prices which are more in the Los Angeles range than that of rural Mexico. It is easy to see the attraction for artists. The light here is unlike anywhere else I have been, perhaps a result of the 6,200 foot altitude. The streets are lit with the reflected light from other brightly coloured buildings, giving everything a sureal glow. 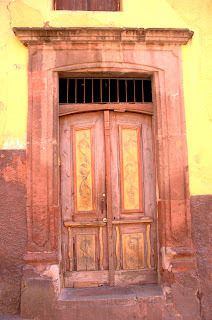 The doors, windows and belconies of San Miguel are spectacular. It would be very easy to spend a month or two here and fill a hard drive with photos. 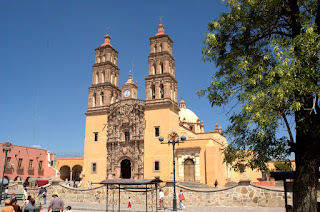 Today we passed through the beautiful little town of Guanajuato ("Wana-wa toe"). The town is built on hillsides and in the bottom of a small valley. Many years ago a nearby river kept overflowing and flooding the town. They tried to solve this by digging tunnels under the town to handle these periodic floods. This did not prove to be a permanent fix so in the end, the river itself was diverted away from the town. The now empty tunnels were converted for use by cars to take traffic off the streets. Access tunnels were dug to connect the tunnels with the streets above. 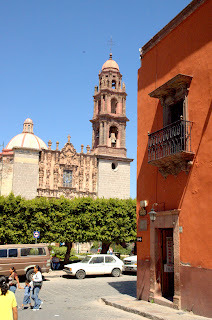 As we approached Guanajuato, my intention was to bypass the town, go on to San Miguel de Allende, check into the RV Park there and then return with the Honda to visit Guanajuato and Delores Hidalgo. Such was not to be! I got slightly confused reading signs and made a disastrous wrong turn with the motorhome INTO the tunnels! Once I turned I was committed. The road is narrow, single-file and one-way and there was a lot of traffic behind me. I did not immediately panic because I read that buses actually use these tunnels. Well, they must be narrow, short buses! There was a sign over the entrance warning of a 3.5 metre height restriction and I was happy that I was only 3.3 metres high! Five inches to spare! Well, there were a couple of small factors this figure did not take into consideration! The tunnels are at the most twenty feet wide but if one could stay in the middle there would be little problem. However, they have decided to allow parking along one side of most of the tunnels, forcing traffic over against the left wall where the sloping walls of the tunnel now come into play! I turned on my hazard lights and headlights and slowly proceeded. The car dolly is about ten or twelve inches wider than the motorhome so so I had two worries. One was having the right dolly wheel get caught on a parked car and the other was striking the sloping-in left wall of the tunnel with the motorhome roof. I sweated my way through several blocks of tunnel until I found an underground bus stop where I could pull over and think (until a bus came along). A cab passed and slowed down but I did not think fast enough to stop and hire him to lead me out of the maze of tunnels. I was going to wait for another cab when a young man walked up to us. I asked him if he was a "Guide" as most residents seem to be and he answered that "si" he was. 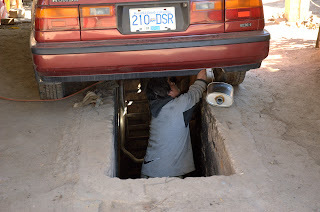 I asked him if he could get us out of the tunnels and onto the road to Delores Hidalgo and he said "si", he could. Norma got in the back, he climbed into the passenger seat and off we went with him directing me. We made several turns when we came to a particularly narrow section of tunnel. As I glanced in the right hand mirror to check the location of the dolly tire, WHAM, I hit the drivers side roof on the wall of the tunnel! It was hard enough to shake the rig pretty good and I felt it making contact along the full 30 foot length of the motorhome. Well, no point in worrying about it now, so I proceeded on until we were out of the maze of tunnels and on a road clearly marked for Delores Hidalgo. I found a place to pull over and asked my guide how much he wanted for his services. He told me in Spanish that he wanted me to pay whatever I thought his services were worth. He had been with us for less than a half hour so I gave him $50 Pesos and asked him if that was enough. His eyes lit up and he assured me it was more than fair. It was only about $5 CAN to me but to him it was a day's pay for a Mexican labourer and obviously much more than he expected. We shook hands and both went away happy. I pulled over as soon as I could to inspect the roof damage. It was not as bad as I originally feared. There is some very slight fiberglass damage to the leading edge of the roof and some minor damage down the full length of the roof edge. The waterproof Eternabond tape that I applied five years ago to solve a pesky roof leak problem is badly torn and pulled off in many places and the metal trim piece that grips the rubber membrane of the roof and holds it to the sidewall is bent and distorted in a few places. I have not seen the top of the roof yet but I do not expect any problems there. I think I can repair it myself with a rubber mallet to pound the metal trim back into shape and a roll of wider Eternabond tape to cover everything up. We arrived in Leon at about 2:00 and decided we wanted to stay for the night see a bit of the town. There are no RV Parks in Leon so we found a Soriana grocery store and parked against the wall on the far side of the lot. Leon is an industrial city specializing in leather goods and gets very few tourists. The result of this is that no one speaks English and our Spanish is not improving rapidly enough. It took the entire six person Security department to give us permission to stay the night. They said it was a very unusual request. They had never been asked before. I then noticed a policeman in a pickup parked behind us so I went out to tell him we had permission to park there. When I got to his door I discovered there were actually two of them in the truck and they were Federales and not city cops. They had flack jackets on and seemed startled that I walked up to them. They were very polite; one spoke perfect English and told me that I was the least of their problems. After they showed me where I was on my city map I walked back and watched as another 25 or so Federales joined them, all in unmarked cars. They got out and met, all carrying side arms and M-16’s or Uzi’s. These guys (and one woman) meant business. They were obviously not there to tell us we were violating a parking ordinance. Later, as we were coming back from dinner, we passed an intersection where there was a great commotion going on. There were dozens of regular police cars with lights flashing, the unmarked cars we saw earlier and a TV reporter telling a story in front of lights. The cab driver tried to tell us what was happening but we could not understand him. It was probably a drug raid. We wanted to take a cab down to the Centro to watch people and have dinner. I found a reference to “Restaurant Cadillac” in the Lonely Planet Guide and asked two cab drivers if they could take us there. Neither knew where it was. I went back to the motorhome and wrote out all the information I could about it, including the address and the name of the square it was on. The next cab said he could find it. In Mexico no taxis have meters so you are always supposed to negotiate the price before you get in. He thought for a second and told us $45 Pesos ($4.10 CAN). We told him fine and jumped in. Well, it was a lot further away than I thought and in Canada it would have been at least $20 one way. He was a good daredevil driver and he and his stick shift Nissan Tsuru got us there alive so I gave him $60 Pesos. He told me I misunderstood him and paid too much and tried to give some back but we convinced him to keep it. It is not much for us but it made this a lucky day for him. He probably expected us to negotiate him down from his $45 Peso opening bid so it was like a 100% tip. Cab drivers rent their cabs from the owners for a set amount per night. One driver in Mazatlan told us he paid $250 Pesos a night. They have to pay this for all seven nights so they cannot work only on the busy nights. They also have to buy gas for the car so it takes a lot of twenty or thirty Peso trips to break even, let alone start to make a living. There are many cabs on the road as well so the competition is pretty fierce. The Restaurant Cadillac sells only pizza and hamburgers so we walked around the Plaza and found an old hotel with outside seating and a guy singing Mexican Jazz. We had a nice dinner (T-bone steak for Norma and Breaded Pescado with lime for me) and then a coffee ($30 CAN including tips for the waiter and the singer). While eating we watched the Plaza come alive with singles, couples and families strolling or sitting on the dozens of benches. Mexicans are a very social people. They do not have to know each other to stop and chat. We made another cabbies night as we paid the same for a cab ride back to the Soriana where we fired up the generator to make coffee to go with our Key Lime pie. Here in the Soriana parking lot in Leon, Mexico, Life Is Good. There is no easy way to get from Villa Corona to Leon without taking the Anillo Periferico around Guadalajara! This was supposed to be a ring road around the city designed to keep traffic out of the heart of the city and in theory, it should work fine for that. In actuality, the road was never completed and only goes about 80% of the way around Guadalajara, leaving a gap right where I needed to exit onto Mexico 80 to Leon. 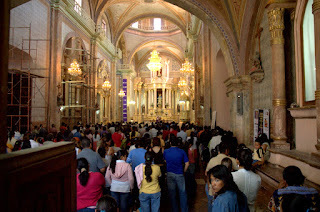 There is a complicated set of instructions in the Church & Church Mexico Camping Guide that involves changing lanes many times at different exits, cross streets and Pemex stations. What the book does not tell you is that some exits are not marked, some highway direction signs are ambiguous to say the least and the dotted lines between lanes have worn right off to the point that the only person who can see what lane you are in is the guy behind you with the big horn. Add to this the propensity of Mexican drivers (at least in Guadalajara) to immediately close any gaps the instant they see your signal that you want into “their” lane. Now add the fact that the speed limit of 80 Km/Hr is treated as no more than a suggestion and you will have some Idea of what I went through! Imagine heading into L.A. on the freeway with the traffic all doing WAY over the speed limit, no one allowing more than four or five feet in front of themselves with cars, trucks and busses passing on the left and right of you while you are trying to change lanes in a 50 foot long motorhome tow car combination for an exit that may or may not be marked correctly, and if it is marked, it is in Spanish. I was very relieved when I finally got on Mex. 80 and all I had to worry about was having enough Pesos for the toll booths. There are five toll booths on the ”Cuota” highway between Guadalajara and Leon. The cost ranged from a low of $3.80 CAN at one to a high of $24 CAN at another totaling about $60 CAN for the 270 Km trip. I can never figure out what governs the charge. There is a complicated list of tariffs posted at each toll booth, outlining charges for extra axels, length, height, passengers, etc. but sometimes the charges differ wildly even though the same tariffs seem to be posted. Basically I suspect they charge whatever the Hell they want to charge! At the last one I got charged $13 and then as I was waiting for her to lift the gate she gave me another bill for $11 for the car! Every other time they put it through as a motorhome and a trailer for a cheaper rate but no, this time it was a motorhome with a car following closely behind. Oh well, it was a nicely maintained road and we pay no other taxes for our six months in Mexico so – what the heck. It’s only money. 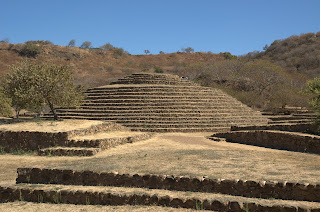 I decided to fight my cold by making a second try to find the Archaeological site at Teuchitlán before I left the area. I wrote down all the alternate names for the site off the Internet and set off with a more positive attitude. I found the site easily using the alternate name as there are signs in the town. It is an amazing sight! 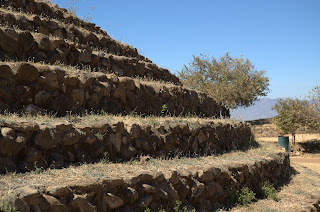 There are two main pyramids with a third yet to be excavated. 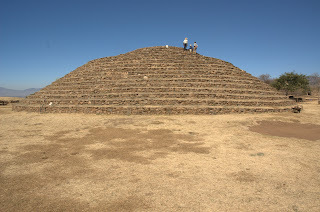 There were several workers on the main pyramid today reinforcing the stones. I was pretty much the only visitor there at the time and as a result had the attention of the on site Archaeologist to myself. She is a young Mexican woman who is very knowledgeable on the excavations. She helped me fill out a detailed response form in Spanish on the site and my questions and observations. It was a beautiful, warm, sunny day and just to have stood where the Pre-Columbian, Pre-Mayan people lived and worked was spellbinding. It is something I shall never forget. We both woke up with bad colds this morning and I hardly slept last night. We have delayed our departure by two days to try to shake it off. I will post again when I have something to report other than a headache! Tomorrow is moving day for us. We are leaving the nicest weather we have experienced so far and traveling North East in hopes of finding more of it! 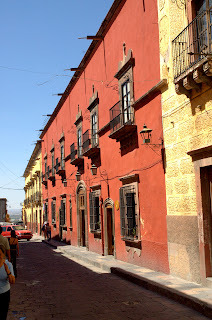 We will be going to the area of Leon, Guanajato, Dolores Hidalgo and San Miguel De Allende areas. 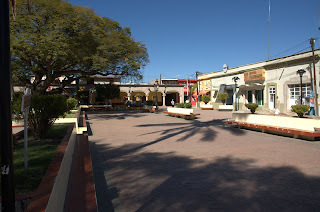 The city of Dolores Hidalgo is where the Revolution against Spanish rule was born at 5:00 AM on September 16, 1810 when Father Miguel Hidalgo y Costilla woke his flock with Church bells and issued his “Grito de Independencia”, or “Cry for Independence”and a call for the abolution of slavery in Mexico. Miguel Hidalgo was no orthodox cleric. He questioned many Catholic beliefs, read banned books and had a mistress. He has been called “a genuine rebel idealist”. He was joined by his friend and fellow revolutionary Ignacio Allende from nearby San Miguel, an aboriginal leader and a fervent believer in the need for Mexican independence. 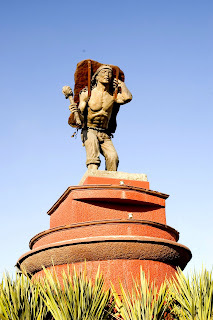 Together they organized the aboriginal people and captured the nearby silver mining city of Guanajato (Wa-na-wato)from its Spanish overlords. 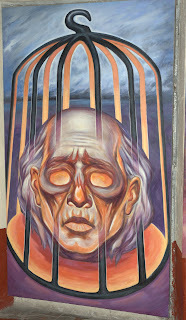 Hidalgo was excommunicated by the Catholic Church for his efforts and, after being captured and executed by the Spanish on July 30, 1811, had his head displayed along with that of Allende and several others for ten years on a wall in the city. Instead of having its desired effect of intimidating the Mexican people into docile obedience, the lurid display spurred the people on to fighting for and eventually winning independence from Spain. After Independence was won, the heads were incorporated inside the Monument of Independence. Migual Hidalgo is a true National Hero and has been honored by more statues and paintings than any other citizen. I am looking forward to exploring this area. 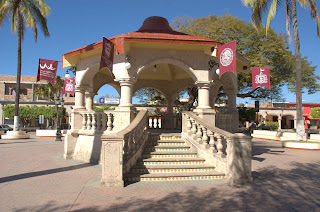 Just a few scenes from downtown Villa Corona. As I was taking these a Mexican kid about 25 - 30 came over and started talking to me in perfect English. He lived in California but came back to his home village at least once a month. He said he was absolutly sick of California and just wants to come home! We hear this same story over and over down here. Mexican youth, legal and illegal, go to the States because they think they can earn a lot of money but soon find that the high cost of living wipes out most of what they earn. Most have a wife and kids in Mexico and miss them terribly while finding it very difficult to send home enough money to keep their families. They are all hoping that the situation will be improved after the next USA election. I hope they are right. These are all very hard working, honest people that just need a chance. They come to the hot springs here in large family groups on their one day off, pay $80 Pesos ($7.50 CAN) for adults and $40 Pesos ($3.75 CAN) for children to get in. They arrive when the pools open and stay until they close, getting full value for their money. They make their meals in the huge, shaded picnic area equipped with tables and barbeques. Mexican are far more family orientated than we are. There are plenty of teenagers here but they are all with their families, taking their turns supervising their younger brothers and sisters. Down For The Count (again)! I got hit by another 24 hour bug yesterday. 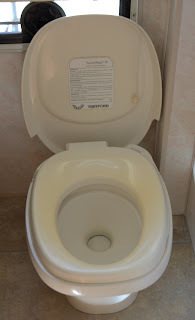 It was not too bad this time but I had a major headache the whole time and could not get too far from my new best friend, the toilet (photo attached). I just lay in bed and ordered soup, bread, Imodium and Tylenol all day. This is the second time I have been hit by this vicious little bug and I have little idea what caused it. I do not drink the tap water but then again I am not fanatical about it. I brush my teeth with it and eat at taco stands, where the food is possibly sometimes washed in tap water. If someone mixes me a drink I do not inquire what water they used for the ice. 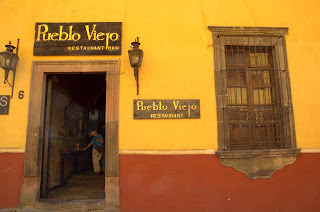 The very few people we have run into who are fanatical about the food and water do not get to experience the “real” Mexico and I feel that the small, calculated risks that I take are well worth the benefits! I personally believe your chances are about the same whether or not you watch carefully. You have to build up immunity to the water at some point as it is virtually impossible to isolate yourself from all sources. My bouts with the “crud” only last 24 hours while some people I have talked to have suffered for a week with it. I think this is because I have developed at least some immunity. Or then again, maybe it was a bad batch of Tequila! I am up and around again today and we are thinking about heading a half hour up the road to the Wal Mart Superstore outside Guadalajara. 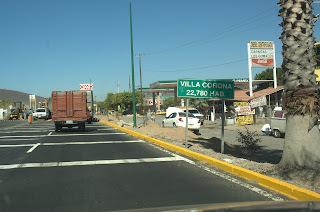 Villa Corona has no large grocery stores, only several very small “corner store” type groceries. There is, however a fantastic bakery within walking distance of the RV Park. I just love Mexican bakeries! This one is very typical of all the bakeries we have found (see photo). 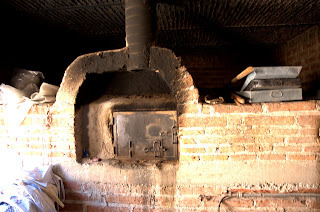 It is small, old and equipped with a wood burning oven that takes up one wall, bricks stained dark from the heat and smoke of generations of bakers plying their trade. 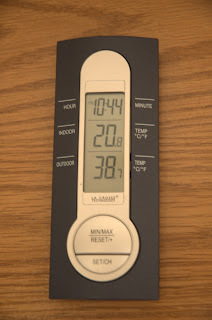 The walls are brick or stone which holds the heat in very well. The smells when you walk in are beyond description! The work is done on a large table in the middle of the room. There is no “counter” but you walk right into the work area where you pick up an aluminum tray and a pair of tongs and walk around picking up your selections. The clerk then uses the same tongs to place your items in a bag, adding up the total. We bought a selection of buns, rolls and cake and when I paid the few Pesos it cost I told the clerk to keep the small amount of change as a tip. As we were walking out the door, the baker came around his table and handed me a huge, steaming hot cinnamon bun that had just came out of the oven as his “thank you” for our business and maybe for tipping his workers. In this county, you always get as good as you give. The muffler on the Honda has been going ever since I whacked it on a “tope” at Robin and Georges condo in Mazatlan. A couple of days ago I started it and the sound was unmistakable. It needed work. 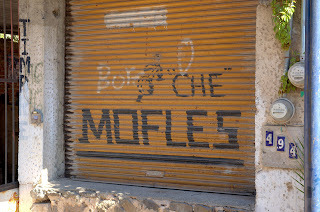 I found “Che” Mofles Shop on the highway in Villa Corona and drove in without an appointment. He had me start the car as he crawled underneath and looked. He told me it would be “Uno momento” while they finished the car that was already in the shop. About twenty minutes later he drove the Honda over the pit and the shop owner ("Che"?) and his helper went underneath and conversed in Spanish. The owner then walked next door and came back with a Mexican who spoke English. We all climbed down into the pit and inspected the damage. I was told the muffler, tailpipe and the entire exhaust pipe up to the catalytic converter had to be replaced. He did not have the correct preformed pipe but had one that he “could make work”. However, he was careful to point out that even though he would only be using part of the pipe, he would have to charge me for all of it as cutting off part would make it worthless to him. I quickly agreed and they started. Two of them worked on the car for about two hours, bending, modifying and welding as they went. I was finally presented with a bill of $600 Pesos or $55 CAN. Once again I was looking at the ingenuity of Mexican workers. They had no pipe bender in the shop. Everything was done with a torch and a tree stump. It was dark in the pit but they worked together so well that no conversation was needed. I drove back to the RV Park and noticed a “banging” under the car as I drove down the cobblestone street. I crawled under the back end and shook the tailpipe, initiating the noise. I drove back to the shop to find the owner had left but the helper was still there. I showed him the “Pequito problemo” and he had me drive over the pit and worked for another half hour, added a bracket and fixed the problem. I offered to pay for the additional parts and work but he refused. I gave him a $50 Peso tip and left with everything working fine. Just another Adventure in Paradise and an even greater admiration for the ingenuity and integrity of Mexican workers.